It goes without saying that dining chair s are only a part of a more complex furniture arrangement – they are placed around the dining table, which is a centerpiece in this case. Consider a classic combination of an oak dining table with brown leather dining chairs – choose lighter oak shades for intoroducing contrast and making the entire arrangement eye-catching and expressive. Go for leather chairs with an oak frame for best effect. Alternatively, if you don’t want anything to draw your attention from your classy leather chairs and their respectable look, a clear glass dining table may be your best choice – moreover, it will create an effect of ’empty’ space that will visually expand your dining area (great solution for small spaces). Glass dining tables also have a number of other benefits – unlike wooden ones, their surface is resistant to heat and moisture – you can find more information on glass tables and their characteristics in this guide. Above, we have mentioned a classic combination of brown leather and light oak – but you can add even more contrast, if you place brown dining chairs in an all white setting. Surely, the contrasting effect of such an arrangement is not as sharp as monochrome black and white – it’s way more mild and creates a reserved and welcoming atmosphere. Wicker baskets, unpainted canvas rugs, wooden statuettes and other natural décor elements would greatly compliment such setting. Reclaimed wood furniture pieces and rustic interiors are enjoying their peak of popularity these days, and brown leather dining chairs are great additions to such interiors. A combination of leather dining chair s and a rustic table will add unforgettable farmhouse accents to your home environment. A rustic bench or an ottoman will also look natural in such settings. When we think of adding colour to a room, we tend to think of bright, saturated colours, but actually, there’s no need to go into extremes. It is quite possible to create a pleasant variety using tan, cream and beige tones – these colours naturally combine with brown leather dining chairs and create a relaxed and easy-going atmosphere. 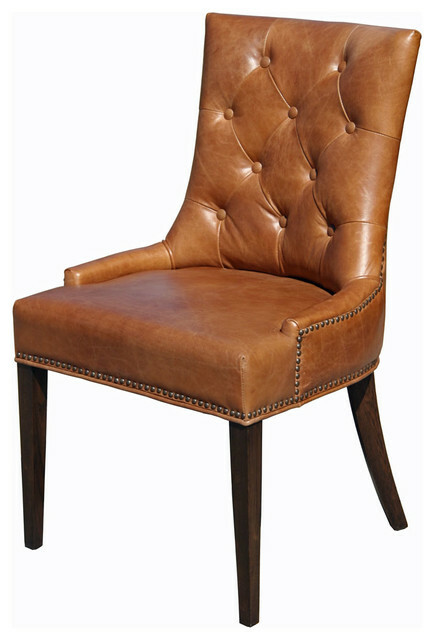 Of course, if you do prefer bright colours, brown leather dining chairs will be a perfect match.